The Little Rock nursing home attorneys of Nursing Home Law Center LLC prosecute cases on behalf of the many elderly patients left to suffer in silence due to the understaffing of nursing homes and disregard for their comfort and safety. We believe the most pressure ulcers are the result of unpardonable negligence merely due to the simple measures needed to prevent them from forming or worsening. If your loved one is suffering from pressure sores during an admission to a Little Rock, AR nursing home, you may be entitled to compensation for his or her injuries as well as the pain and suffering he or she has endured. Contact the Nursing Home Law Center today for a free review of your legal rights and options for recovery. Little Rock is both the capital and largest city in Arkansas and is home to 198,000 people. Its population is incredibly diverse and includes a senior segment that comes to 11.3% of the populace. With so many residents aged over 50 years of age, the senior segment is projected to grow in the near future, calling for the need of senior services and programs. Seniors looking to connect with their peers and to lead active and healthy lifestyles may be able to find what they are seeking through one of the seven community centers located throughout the city. These centers offer educational courses, fitness programs, social events and more so that community members can connect in a positive way with one another. To learn more, you can visit here. Little Rock residents have access to 27 nursing homes within 25 miles of the city, but only one of these facilities has received a perfect grading from Medicare. This means that finding the right nursing home may require searching for facilities located farther away. The best way our Little Rock pressure sore lawyers have found to locate nursing homes that will be best suited to your loved ones’ needs is to use the nursing home compare tool provided by Medicare. This useful tool allows you to search for nursing facilities by area, compare homes side by side and see whether the facilities you are considering have been penalized or fined for misconduct or negligence. It also grades each center’s staff based on the ratio of skilled positions to the amount of patients being served. It only took us moments to eliminate Highlands of Little Rock at Cumberland as a viable option, for example by noticing its poor health inspection record and $162,000 in fines over the last three years. 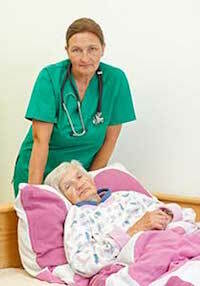 If you would like to access the nursing home compare tool, simply visit the Medicare website. We are appalled at how callous owners and administrators of for-profit nursing homes can be when they choose to eliminate skilled staff members in favor of padding their profit margins. The patients always pay the price for this and caregivers must shoulder an unbearable load when attempting to care for more residents than they are capable to serve. If a nursing center does not employ enough staff members such that patients can be repositioned and checked in with several times a day, there is a systemic problem which needs to be addressed. This is why we will always seek as much compensation from these negligent nursing centers as the law will allow. It is to ensure that victims have the resources they need to heal from their wounds while sending a clear message to the industry that this behavior will no longer be tolerated. Nursing Home Law Center LLC has helped thousands of victims recover fair compensation for the injuries they’ve endured because of neglect and abuse. We understand that you cannot take the decision to select legal representation lightly, which is why we are happy to evaluate your case without charge or any obligation. Contact us today to be connected with one of our award-winning Little Rock bedsore injury attorneys so that we can collect the information we need to investigate your claim and review your legal options together.